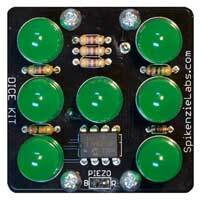 The Dice Kit is a deluxe electronic die. To use it, tap it on a table and with each tap the you are "rolling" the dice. Each tap displays a number from 1 through 6 by lighting up the appropriate number of LEDs in a traditional 'Dice' Layout. Includes CR2032 battery.